Local communities want action. 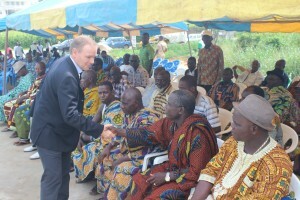 That’s why all the projects of Golden Veroleum Liberia are now subject to a real partnership with indigenous people. The industry of palm oil need to compromise with local communities. James Mulbah knows how forests work. After fleeing Liberia’s civil war, aged seven, he and his family lived as refugees in a forest village in Guinea for the next eight years, reliant on the environment for food, medicine and fuel. The trained sociologist is now putting that knowledge to good use in his native country. Mulbah is part of the community affairs team at Golden Veroleum Liberia (GVL), an oil palm developer whose main investor is Singapore-based giant Golden Agri-Resources. His job is to persuade local people to let the company plant oil palm on the land where they have subsisted for generations. It’s a painstaking process, requiring several months of consultation and negotiation. The company has just signed its third agreement in Grand Kru County, covering some 1,800 hectares. In return, the two communities involved will receive an annual payment of $5 per hectare, jobs, scholarships, hand pumps for water and a slice of plantation for themselves. Schools and a road will be rehabilitated. GVL is the first big company to start operations in Grand Kru, and its arrival stirs mixed emotions and sometimes false expectations, Mulbah told Thomson Reuters Foundation from its office there. GVL hasn’t always taken such a nuanced approach. In 2010, the Liberian government awarded it a 65-year concession to grow oil palm on some 350,000 hectares in the West African country’s southeast. But after starting work in Sinoe County, it was criticised for failing to respect both community land rights and the planting procedures of the Roundtable on Sustainable Palm Oil (RSPO), a not-for-profit association that runs an international certification scheme for ethical palm oil. The U.N. Security Council even warned that animosity between local communities and GVL raised “a distinct possibility of land-related conflict”. “The GVL concession is an example of a missed opportunity to integrate rural growth plans into one of the largest private sector investments in Liberia,” it said in a 2012 report. Since then, the company’s attitude has changed. It now recognises it must gain what is called “free, prior and informed consent” (FPIC) from local people before the first oil palm tree is planted, Mulbah said. That involves sitting down with communities, giving them clear information in their own language, mapping the area together, deciding which parts can be used, and then agreeing on the compensation they will receive. The shift in GVL’s approach is indicative of a wider transformation across the rapidly expanding international palm oil industry. Palm oil is an edible vegetable oil derived from the fruit of oil palms and is a globally traded agricultural commodity, widely used in food products like chocolate and margarine, as well as in cosmetics and biodiesel. Since late 2013, some of the biggest growers and traders of palm oil – including Wilmar International and Golden Agri-Resources – have made new promises or extended previous policies to guarantee by a certain date that their product will no longer cause deforestation, nor exploit workers and local people.